Solo & Orchestra bassist, Conservatory Professor, Editor, Arranger, Art Collector, Painter, Sculptor. Herman Reinshagen at the Institute of Musical Art, New York (later Juilliard School) ; Francesco Gamberini in Naples and Isaia Bille in Rome during a visit to Italy. Harlod Smith in London. Distinguished Leadership Award by the American String Teacher Association. Presented posthumously at the Music Educators National Conference, Milwaukee on March 31, 1973. Georges Andre, Wyatt Bennett, Alan Birnbaum, Alvin Brehm, James Brennand, Orin O’Brien, Lucas Drew, Wilmer Fawcett, Martin Flowerman, Theodore Flowerman, Kenneth Friedman, Samuel Hollingsworth, Robert Gladstone, Murray Grodner, Joseph Gustafeste, Milton Kestenbaum, Linda McKnight, Barrie Kolstein, Samuel Kolstein, Donald Palma, Rip Pretat, Frank Proto, Robert Rohe, Stuart Sankey, Harold Shachner, Neil Stannard, Jesse Teiko, Marvin Topolsky, David Walter. Eddie Gómez, Henry Grimes, Red Mitchell. Schuller, Gunther. 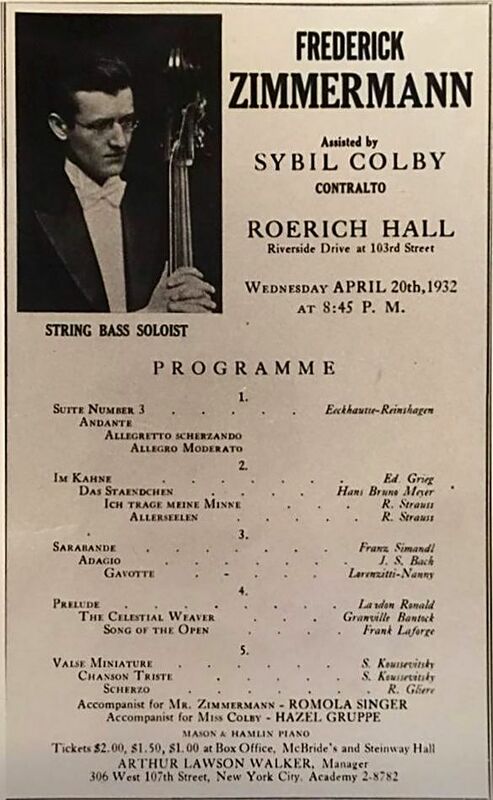 Quartet for Basses (1947) – April 8, 1960 at Carnegie Recital Hall. Conducted by Gunther Schuller. Performed by Robert Gladstone, Alvin Brehm, Frederick Zimmermann and Orin O’Brien. The first public concert of a bass consort in the US. Performed by Robert Gladstone, Frederick Zimmerman, Orin O’Brien, Alvin Brehm, double basses. Walter, David. “Gunther Schuller, Champion of the Instrumental Underdog.” International Society of Double Bassists. VII, No. 3 and 4 (Spring and Summer 1981): 714-715. Track no. 7. Revelations : first movement (12:01) by Charles Mingus – F. Zimmerman performer (among others), recorded June 18, 1957 in New York. Although classified as a Jazz composition, and along featured on a “jazz album” this piece composed by Milton Babitt features “a twelve-tone pitch structure using an all-combinatorial (12 tone) set.” Frederick Zimmerman is cited as a performer on this 1957 recording. Grillo, John. “CBC 155: Frederick Zimmermann Practice Tapes.” Contrabass Conversations – Double Bass Podcast. Recorded Phone Interview with Jason Heath. July, 2010. Blog Post. Zayde, Jasha. “Frederick Zimmermann and Orin O’Brien Play Duets.” WQXR, New York. n.d.
Kolstein, Samuel. “The Kolstein-Zimmermann Registered German Bass Bow.” International Society of Bassists, V, no. 3 (1979): 511. Formation of the first American bass consort ensemble and along the promotion, commission and creation of literature for the same group in scoring for trios, quartets and larger types. H. R. Pfretzchner, n.d. swan head model. August 3, 1967, Ohlstadt, Germany (during a visit), resting place New York City. “Frederick Zimmermann, 61, Philharmonic Double Bassist.” New York Times. 9 August 1967. “In Memoriam : Frederick Zimmermann.” The Bass Sound Post. [no. 3] (November 1967): 24. “Obituary–Fred Zimmermann.” Variety. 247: 13, 16 August 1967: 63. “Obituaries.” Juilliard News Bulletin, VI : 1, November, 1967: 12-13. “Obituary–Frederick Zimmermann.” Hi-Fi/Musical America, (November 1967): 17:11, MA14. “Obituary–Frederick Zimmermann.” International Musician, 66:19 (October 1967): 6. “Fred Zimmerman / Charles Mingus Double Bass Competition.” November 19-22, 1981, Cincinnati, Ohio. Gellert, Karen Hansen. “The 1981 I.S.B. Zimmermann/Mingus Double Bass Competition & Workshop : November 19 – 22, 1981 Cincinnati, Ohio” International Society of Bassists : Bass World, VIII, no. 2 (1981): 1. Zimmermann, Frederick. “Design for Study.” The School Musician. 36:30 (Jan. 1965): 29-30. Zimmermann, Frederick. “The Art of the Double Bass.” Music Journal. XXIII:5 (May 1965): 40, 74-75. Zimmermann, Frederick. “The Double Bass in Ensemble.” American String Teacher. XIV:4, (Fall 1964): 12. Applebaum, Samuel and Sada Applebaum. “With the Artist: Frederick Zimmermann.” Violin and Violinists. 21:6 (November-December 1960): 239-242, 249. Gladstone, Robert. “Fred Zimmermann: A Tribute / Robert Gladstone” International Society of Bassists : Bass World, VIII, no. 2 (1981): 16-17. Kolstein, Samuel. “Mr. Z – by Samuel Kolstein.” International Society of Bassists : Bass World, VIII, no. 2 (1981): 11-12. Mickman, Herb. “Bass Lessons with Mr. Zimmermann and Mr. Mingus.” International Society of Bassists : Bass World, VIII, no. 2 (1981): 21-22. Slapin, Bill. “From Bach to Buisness and Back.” International Society of Bassists : Bass World, VIII, no. 2 (1981): 23. Walter, David. “Mr. Z – A Personal Memoir by David Walter.” International Society of Bassists : Bass World, VIII, no. 2 (1981): 7-8. Walter, David. “Noble Instrument.” International Society of Bassists. III, no. 3, (1977): 269. Webster, Daniel. “Crusades for the Bull Fiddle.” The Philadelphia Inquirer. Sunday, (n.d.): Section 5, 272:52, 13. Whitman, Alden. “Less Zum-Zum for Mr. Z’s Bull Fiddle.” The New York Times. 25 Jul. 1965: Section 2, CXIV:39264, 9. Zimmermann, Frederick. “Illustration.” The New York Times. 4 Oct. 1931: section 8, LXXXI:26916, 8X. Rives, James. “Orchestral Excerpts” in “New Bass Materials” The Bass Sound Post. [no.10] (October 1969): 28-29. Webster, Richard L. “A Contemporary Concept of Bowing Technique for the Double Bass.” Music Educators Journal 53.8 (1967): 113. “A Night for Bass Players.” The Philadelphia Evening Bulletin. 1 March 1965. “Chamber Ensemble.” The New York Herald Tribune. 10 Feb. 1953: CXII:38, 803, 23. “Contrabassist Joins Contralto in Recital.” The New York World Telegram. 21 April 1932: 64:249, 16. “Double Bass in Recital.” The New York Times. 21 April 1932, LXXXI:27, 116, 24. “Frederick Zimmermann Gives Double Bass Recital.” The New York Sun. 21 April 1932: XCIX:197, 20. “Frederick Zimmermann in Double Bass Recital.” The New York Herald Tribune. 21 April 1932: XCII:31, 203, 14. Kraglund, John, “Mr. Zee Strings NYO Together.” The Toronto Globe and Mail. July 1964. “Local Music Group Ends Second Year.” The New York Times. 10 February 1953: CII:34716, 24. Luca, Sergiu, “A Bow for Every Occasion.” The New York Times : Arts and Leisure. 17 December 1978: CXXVIII:44069, 25. “Music Notes.” The New York Evening Post. 21 April 1932: 131:133, 14. Salzman, Eric, “Schuller Works Heard in Concert.” The New York Times. Saturday, 9 April 1960: CIX:3733l, 17. Singer, Samuel L. “Bass Violin Concert Unique.” The Philadelphia Inquirer. 1 March 1965: 272:60, 20. Thomas, Ralph, “He’s Not Fiddling Around.” Toronto Star. 1963. Pergolesi, Giovanni Battista. “Trio for Double Basses : Larghetto” Bass World VIII, No.1 (1981): 757-760. Weinstein, Milton. “Phrygian No.2.” Edited by Frederick Zimmermann. Bass World VIII, No.1 (1981): 754-756. Post by Paul Nemeth. Fred Zimmermann’s NY recital debut in 1932. “Bass Heritage Board” group, Facebook. December 28, 2016. Post by Igor Pecevski. Leonard Bernstein conducting New York Philharmonic, 1967 video featuring possibly F. Zimmermann in bass section. “Bass Heritage Board” group, Facebook. January 7, 2015. Post by Jonathan Cable. Letter from Frederick Zimmermann to Jonathan Cable. “Bass Heritage Board” group, Facebook, October 13, 2014. Blumenthal, Jay S. Frederick Zimmermann: Double Bass Performer and Pedagogue. Ph.D. Thesis, New York University, 1983. Frederick Zimmermann Collection of Double Bass Music. Music Division, New York Public Library. Frederick Zimmerman Papers 1933-1959. Rare Book & Manuscript Library. Columbia University. Frederick Zimmermann Memorial Collection. University of Miami, Music Library. Zimmermannn, Frederick. Property for the Estate of Frederick Zimmermann. Louis J. Marion Associates, Inc. , October 25, 1967. Bernstein, Leonard. Letter from Leonard Bernstein to Frederick Zimmermann. n.d.
Drew, Lucas. Letter from Lucas Drew to Frederick Zimmermann, 18 Sep. 1966. Elgar, Raymond, Letter from Raymond Elgar to Frederick Zimmermann, 1 Aug. 1966. Hall, Sir Noel, Letter from Sir Noel Hall to Frederick Zimmermann. n.d.
Hertl, Frantisek, Letter from Frantisek Hertl to Gary Karr, 22 Jan. 1967. Mennin, Peter, Letter from Peter Mennin to Frederick Zimmermann, 8 Nov. 1966. Walter, David, Letter from David Walter to Frederick Zimmermann, 9 July 1966. Zimmermann, Frederick, Letter from Frederick Zimmermann to a young bass player. n.d.
Zimmermann, Frederick. Andante. January 1933. Manuscript, f. 1030, Zimmerman Collection in NY Public Library. Bottesini, Giovanni. Reverie: For String Bass and Piano. Edited by Frederick Zimmermann. New York City: International Music Co, 1957. Bottesini, Giovanni. Tarantella in a Minor for String Bass and Piano. Edited by Frederick Zimmermann. New York City: International Music Co, 1956. Glière, Reinhold M. Intermezzo: Opus 9, No. 1, for String Bass and Piano. Edited by Frederick Zimmermann. New York City: International Music Co, 1956. Glière, Reinhold M. Prelude in D Major: Opus 32, No. 1, for String Bass and Piano. Edited by Frederick Zimmermann. New York: International Music Co, 1957. Glière, Reinhold M. Scherzo: Opus 32, No. 2, for String Bass and Piano. Edited by Frederick Zimmermann. New York: International Music Co, 1958. Koussevitzky, Serge. Chanson Triste: Opus 1, for String Bass and Piano. Edited by Frederick Zimmermann. New York: International Music Co, 1949. Koussevitzky, Serge. Valse Miniature: Opus 1, No. 2, for String Bass and Piano. Edited by Frederick Zimmermann. New York: International Music Co, 1949. Koussevitzky, Serge. Concerto, Opus 3, for String Bass and Piano. Edited by Frederick Zimmermann. New York: International Music Co, 1948. Simandl, Franz. Concert Study: In E Minor, Opus 66, for String Bass and Piano. Based on a motif by Joseph Hrabě. Edited by Frederick Zimmermann. New York City : International Music Co., 1956. Simandl, Franz. Scherzo Capriccioso: Opus 72 for String Bass and Piano. Edited by Frederick Zimmermann. New York City: International Music Co, 1957. Simandl, Franz. Tarantella Opus 73 for String Bass and Piano. Edited by Frederick Zimmermann. New York City: International Music Co, 1957. Stein, Eduard. Concertpiece in a Major: Op. 9 : for String Bass and Piano. Edited by Frederick Zimmermann. New York: International Music Co, 1957. Weinstein, Milton. Contemporary Modal Solos: For Double Bass and Piano. Edited by Frederick Zimmermann. Coral Gables, Fla: University of Miami Music Publications, 1971. Weinstein, Milton. Contemporary Modal Solos. Edited by Frederick Zimmermann and David Walter. Elmsford, N.Y: MMO Music Group, 1995. Ayres and Dances: For Double Bass and Piano. Arranged by Frederick Zimmermann. Coral Gables, Fla: University of Miami Music Publications, 1971. Three Sonatas for Double Bass and Piano. Arranged by Frederick Zimmermann. Coral Gables, Fla: University of Miami Music Publications; sole agent: S. Fox, New York, 1973. Bach, Johann S. Adagio: From the Organ Toccata in C Major, S.564 : for String Bass and Piano. Arranged by Frederick Zimmermann. New York: International Music, 1965. Bach, Johann S. Aria, from the Suite No. 3: For String Bass and Piano. Arranged by Frederick Zimmermann. New York: International Music, 1958. Bach, Johann S. Bach for the Young Bass Player. Arranged by Frederick Zimmermann.New York: MCA Music, 1967. Bach, Johann S. Gavotte, String Bass Solo with Piano Accompaniment. Arranged by Frederick Zimmermann. New York: C. Fischer, 1938. Bach, Johann S. Menuet G Major. Arranged by Frederick Zimmermann. New York: C. Fischer, 1940. Bach, Johann S. Toccata. Organ BWV 564, C major, Adagio, Arranged by Frederick Zimmerman for double bass and piano. n.d., Manuscript, f. 341, Zimmerman Collection in NY Public Library. Chopin, Frédéric. Maiden’s Wish. Arranged by Frederick Zimmermann. New York: C. Fischer, 1938. Corelli, Arcangelo. Sonata : in D Minor: For String Bass and Piano. Arranged by Frederick Zimmermann. New York: International Music Co, 1951. Corelli, Arcangelo. Sarabande. Arranged by Frederick Zimmermann. New York: C. Fischer, 1938. Croft, William. Sonata. Arranged by Frederick Zimmermann. [New York], 1965. Manuscript. Dvořák, Antonín. Songs My Mother Taught Me: Gipsy Melody. Arranged by Frederick Zimmermann. New York: Fischer, 1938. Eccles, Henry. Arranged by Frederick Zimmermann. Sonata in G Minor: For String Bass and Piano. New York: International Music Co, 1951. Fauré, Gabriel. Après Un Rêve: For String Bass and Piano. Arranged by Frederick Zimmermann. New-York: International Music Company, 1950. Fauré, Gabriel. Sicilienne Opus 78 for String Bass and Piano. Arranged by Frederick Zimmermann. New York: International Music Co, 1956. Galliard, John E. Sonata in F Major, for String Bass and Piano. Arranged by Frederick Zimmermann. New York: International Music Co, 1949. Handel, George F. Largo. Arranged by Frederick Zimmermann. New York: C. Fisher, 1938. Handel, George F. Largo from Xerxes. Arranged by Frederick Zimmermann. Kansas City: Jenkins Music Company, n.d.
Handel, George F. Sonata in G Minor for String Bass and Piano. Arranged by Frederick Zimmermann. New York: International Music Co, 1951. Marcello, Benedetto. Sonata, in A Minor, for String Bass and Piano. Arranged by Frederick Zimmermann. New York: International, 1949. Marcello, Benedetto. Sonata in F Major for String Bass and Piano. Arranged by Frederick Zimmermann. New York: International Music, 1957. Marcello, Benedetto. Sonata in G Major, for String Bass and Piano. Arranged by Frederick Zimmermann. New York: International Music, 1949. Marcello, Benedetto. Sonata in G Minor for String Bass and Piano. Arranged by Frederick Zimmermann. New York City: International Music Co, 1957. Massenet, Jules. Mélodie: Op. 10. Arranged by Frederick Zimmermann. New York: C. Fischer, 1938. Monteverdi, Claudio. Six Monteverdi Songs: For Double Bass and Piano. Arranged by Frederick Zimmermann. New York: MCA Music, 1968. Mozart, Wolfgang A. Minuet, K.334, for String Bass and Piano. Arranged by Frederick Zimmermann. New York: International Music, 1960. Pergolesi, Giovanni B or Vincenzo L. Ciampi. Tre Giorni: Siciliana from Nina. Arranged by Frederick Zimmermann. New York: C. Fischer, 1938. Purcell, Henry. Aria for String Bass and Piano. Arranged by Frederick Zimmermann. New York City: International Music Co, 1951. Tchaikovsky, Peter I. Andante Cantabile for String Bass and Piano Opus 11. Arranged by Frederick Zimmermann. New York: International Music, 1958. Tchaikovsky, Peter I. Barcarolle: Opus 37, No. 6, for String Bass and Piano. Arranged by Frederick Zimmermann. New York: International Music Co, 1958. Vivaldi, Antonio. Sonata in A Major, for String Bass and Piano. Arranged by Frederick Zimmermann. New York City: International Music Co, 1966. Vivaldi, Antonio, Sonata No. 2 in F Major: For String Bass and Piano. Arranged by Frederick Zimmermann. New York: International Music, 1965. Vivaldi, Antonio. Sonata No. 3 in a Minor for String Bass and Piano. Arranged by Frederick Zimmermann. New York City: International Music Co, 1955. Vivaldi, Antonio. Sonata No. 4 in B Flat Major: For String Bass and Piano. Arranged by Frederick Zimmermann. New York City: International Music Co, 1957. Vivaldi, Antonio. Sonata No. 5 in E Minor for String Bass and Piano. Arranged by Frederick Zimmermann. New York City: International Music Co, 1957. Vivaldi, Antonio. Sonata No. 6 in B Flat Major: For String Bass and Piano. Arranged by Frederick Zimmermann. New York: International Music, 1957. Romberg, Bernhard. Sonata, Opus 43, No. 1, for Two String Basses. Arranged by Franz Simandl. Edited by Frederick Zimmermann. New York City: International Music Co, 1956. Zimmerman, Frederick. Trios and Quartets for Double Basses: Vol. 1. Edited by Lucas Drew. Miami, Fla: UMMP, 1971. Zimmerman, Frederick. Trios and Quartets for Double Basses: Vol. 2. Edited by Lucas Drew. Miami, Fla: UMMP, 1971. Zimmerman, Frederick. Trios and Quartets for Double Basses: Vol. 3. Edited by Lucas Drew. Miami, Fla: UMMP, 1973. Zimmerman, Frederick. Trios and Quartets for Double Basses: Vol. 4. Edited by Lucas Drew. Miami, Fla: UMMP, 1973. Arrangements for Double Bass Trio. n.p., n.d. Manuscripts. Lasso, Orlando. Mon Coeur: 4 Basses. Arranged by Frederick Zimmermann, n.p., n.d. Manuscript photocopy. Brehm, Alvin. Two Scherzi for Three Contrabass. New York : Exclusive representatives, G. Schirmer, 1977. Freedman, Harry, Trio for Double Basses. n.p., n.d.
Schwartz, Elliott. Sonata. General Music Publishing Co., New York,. 1965. For violin and double bass. Inscribed by Schwartz to Zimmermann. Schuller, Gunther. Quartet for Double Basses. Firenze: A. Bruzzichelli, 1965. A Contemporary Concept of Bowing Technique for the Double Bass. Milwaukee, WI: H. Leonard Corp, . A Contemporary Concept of Bowing Technique for the Double Bass. New York: MCA Music Publishers, 1990. A Contemporary Concept of Bowing Technique for the Double Bass. Milwaukee, WI: H. Leonard Corp, 1985. A Contemporary Concept of Bowing Technique for the Double Bass. New York: Leeds Music Co, 1976. A Contemporary Concept of Bowing Technique for the Double Bass. New York: MCA Music, 1966. A Contemporary Concept of Technique for the Double Bass. New York: Leeds, 1956. O’Brien, Orin. “Frederick Zimmermann’s A Contemporary Concept of Bowing Technique for the Double Bass.” Strad. 121.1445 (2010): 85-88. Webster, Richard L. “Book Review: A Contemporary Concept of Bowing Technique for the Double Bass.” Music Educators Journal. 53.8 (1967): 113. O’Brien, Orin. Double-bass Notebook: Ideas, Tips and Pointers for the Complete Professional. New York: Carl Fischer, 2016. Simandl, Franz. New Method for the Double Bass. Revised by F. Zimmerman ; Edited and annotated by Lucas Drew. New York: C. Fischer, 1987. Simandl, Franz. New Method for the Double Bass. Revised by F. Zimmerman ; Edited and annotated by Lucas Drew. New York: C. Fischer, 1984. Simandl, Franz. New Method for the Double Bass: English and German. Edited by Frederick Zimmermann. New York: C. Fischer, 1948. reprint, 1964. Simandl, Franz. New Method for the Double Bass. Vol. 1 from 1904 edition ; Vol. 2 edited and revised by Frederick Zimmermann. New York: C. Fischer, 1948. O’Brien, Orin, “Double Bass Lessons and Assignments with Frederick Zimmerrnann,” September 21, 1954. Diary. Findeisen, Theodor Albin. 25 Technical Studies: Opus 14, for String Bass. Edited by Frederick Zimmermann. New York City: International Music Co, 1957. Hrabě, Josef. 86 Etudes for String Bass. Edited by Franz Simandl, Newly Edited by Frederick Zimmermann. 2 vols. New York: International Music Co, 1959. Simandl, Franz. 30 Studies for String Bass. Edited by Frederick Zimmermann. New York City: International Music Co, 1956. Simandl, Franz. Gradus Ad Parnassum: 24 Studies for String Bass. Edited by and Frederick Zimmermann. 2 vols. New York City: International Music Co, 1957. Slama, Anton. 66 Studies in All Keys: For String Bass. Edited by Frederick Zimmermann. New York City: International Music Co, 1957. Storch, Josef E, and Josef Hrabě. 57 Studies in Two Volumes: For String Bass. Revised by Albin Findeisen. Edited by Frederick Zimmermann. 2 vols. New York: International, 1948. Storch, Josef E, and Josef Hrabě. 57 Studies in Two Volumes: For String Bass. Revised by Albin Findeisen. Edited by Frederick Zimmermann. New York: International Music, 1958. Sturm, Wilhelm. 110 Studies for String Bass, Op. 20. Edited by Frederick Zimmermann. New York: International Music Co, 1963. 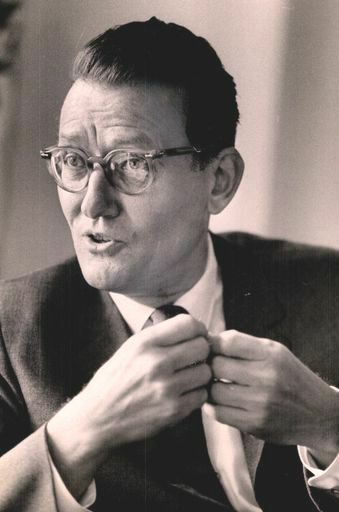 Kreutzer, Rodolphe. 18 Studies for String Bass. Transcribed by Franz Simandl, and edited by Frederick Zimmermann. New York: International Music Co, 1950. Lee, Sebastian. 12 Studies, Opus 31, for String Bass. Arranged by Frederick Zimmermann. New York City: International Music Co, 1957. Schwabe, Oswald. Scale Studies: For String Bass. Edited by Frederick Zimmermann. New York City: International Music, 1948. Difficult Passages for Double Bass. Compiled by John Reynolds. New and Revised edition by Frederick Zimmermann. New York: Boosey, Hawkes, Belwin, 1940. Orchestral Excerpts from the Symphonic Repertoire for String Bass. Compiled and Edited by Fred Zimmermann. 8 vols. New York: International Music Company, 1964-1987. Concert at the Bruno Walter Auditorium. New York, 2007.